As crime continues to rise and the threat of terrorist attacks is always imminent, it is important that security teams have the right tools for the job. This includes not just non-lethal weaponry but scanning tools as well. Everywhere there are large crowds of people or places that need heightened security, security metal detectors are used to ensure that anything dangerous will not be allowed in. One metal detecting tool in particular that is helpful for security screening is the security wand (also called metal detector wand). This handy little device is used in night clubs, airports, schools, jails as well as manufacturing and distribution facilities. The purpose of the metal detecting wand is for general screening in busy places. Typically, a security team will use a larger walk through metal detector and if metal is found on someone's body then the hand held metal detector is brought in to pinpoint it. 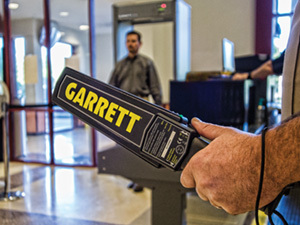 In low volume areas, the handheld metal detector is used in place of the of walk through metal detector. Security wands come in a wide varieties of shapes and sizes. There are however two typical varieties that security teams utilize. The first comes in around an inch in diameter and is used by military, police and security personnel around the world. This pen shaped handheld metal detector wand provides the same sensitivity as some of the bigger models just in a smaller size. The smaller sized models can be perceived as more intrusive to the person being scanned than the larger models so it is good idea to gauge individual's reactions before their usage. The second type of metal detector wand is longer and is paddle shaped. This is the most common one used in almost every security situation. These longer metal detector wands are built to last and can withstand continuous use in some of the harshest environments. The long handle metal detector wands are so effective that security teams use them in Olympic events and to protect heads of states. There are lesser quality long handle metal detector wands being made in East Asia so it is important to find one that will last. 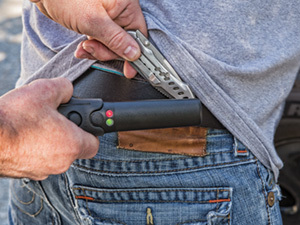 The most common metal detector wands will usually have one or more of three specific features to assist security personnel. The first most frequently found feature is the audible tone alert. The security personnel will be able to hear a an audible tone from the external speaker or plug in headset when passing over a metallic object. This can be hard to hear in a nightclub or manufacturing facility. That's why some handheld metal detectors include second feature called a target identification light to combat noisy areas. This feature is great if the user is looking at the device. If they are not then they won't be able to obtain a reading. The third feature that works the best is the the vibration alert system. Only the security personnel operating the handheld metal detector is aware that a target has been located. This is important if the target is a weapon as it will give the security team member additional time to address the situation. Best of all, its great for noise environments or when the security team member is not looking at the device because they only need to feel the vibration. When choosing a metal detector wand, it is important to address the security needs of the situation. Just because one device works great in an area does not mean that another one will. It is important to devise a security strategy based on how much traffic is coming through the area, how individuals with possible targets will react to being screened, the location of the security screening as well as any environmental factors that will affect the screening.